The Church of All Saints was built in the early 1100’s on the site of a previous church or chapel. It is the oldest building in the village by far. The manor (meaning the land) of West Farleigh was given to Bishop Odo by William the Conqueror, taken away from him and given to Robert de Crevecour. It seems likely that he was responsible for the building of the church. We are unsure why it has its current position but we do know that there was another old church on the other side of the river - West Barming church, of which nothing remains. There was a ford across the river between the two (The river was much shallower before the locks were put in place) It is thought that later there was also a bridge aross to Barnjet Priory, the house immediately opposite. Did the monks use both churches? It is a typical Norman church and unlike many churches has not been enlarged and it is very easy to imagine how it was originally. There are still Norman slit windows visible, although larger windows have been put in at a later date and some of the Norman slits were filled in. The Norman slit windows in the chancel above the altar can be seen. The stained glass was put in much later. Originally the nave would have been empty with a few benches round the walls. (Weakest go to the wall). Recent excavations of a Roman Villa at East Farleigh have found a temple and the dimensions of the entrances are exactly the same as the dimensions of the Chancel arch and the arch around the west door. Both are made of tufa a light limestone found locally. 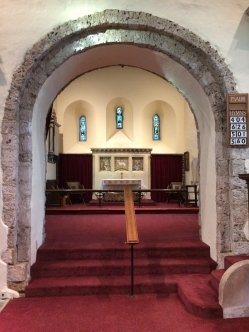 It is possible that the Roman site was used as a quarry and the arches were removed and erected in the church. 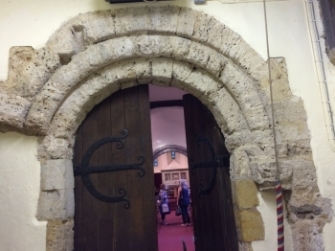 The fact that the arch around the West door is not complete, suggests that it may have come from elsewhere, or that it was damaged at some time. An altar to Our Lady was put in, about 100 years later, together with a piscina (for the ceremonial washing of the priests hands before preparing the elements of communion) and a sedilia (a seat for the priest). Both are still there. You can see the drain hole in the piscina. These can be seen by the main altar also. Pictured is of the Piscina in the Nave next to where the Altar to Our Lady would have been. It is now fitted with a light which shows off the floral arrangements! 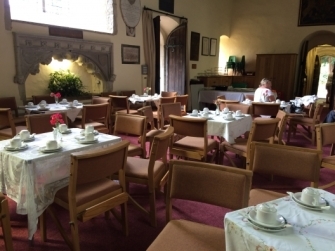 There is a similar arrangement by the altar in the Chancel. Robert Tottesham of Tottesham (Tutsham) Hall made several gifts to the church and it is thought that the recess in the south wall contained a memorial to him, maybe a recumbent figure. Again the floral displays are backlit. In the 14th and 15th centuries bigger windows were inserted and the font we see today was installed with its elaborate carved cover. It no doubt replaced an earlier, more rustic font. 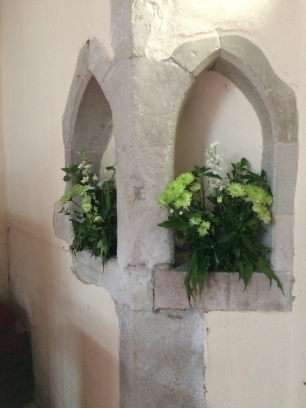 It was originally by the south door of the church.This was the traditional place for a font. To be a full member of the Christian church, one needs to be baptised and this was done at the door of the church as a symbolic gesture to demonstrate the "entering in”. It also serves to remind all those coming into the church and passing it by, of the promises they made or were made for them. At the Reformation, Latin was replaced by English, our church still has its original copy of the 1611 Authorised version. All crucifixes and statues were removed and the stone altar replaced with a wooden table. A bronze Cross with emblems of the Evangelists was buried for safe keeping. It remained buried for nearly 300 years, however it was found in 1832 during some excavation. It is now in the British Museum for safekeeping. They have two others but ours is the most intact. There is a painting of it in the chancel. 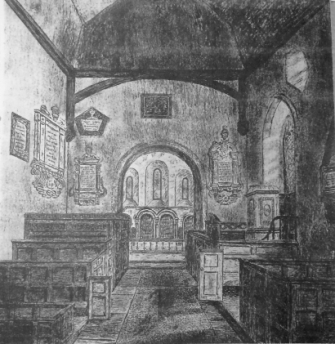 Opposite: A drawing of the church post Reformation showing the boxpews. Preaching became important and a three decker pulpit was installed where the Altar to Our Lady had stood. An elaborately carved box pew was put in, at the left of the arch. There are memorials to Brewer family of Smiths Hall above where it stood. Other less elaborate box pews were installed for other families in the village. The working classes would have sat at the back or in the newly installed gallery, where there was also a barrel organ to play the accompaniment to hymns. 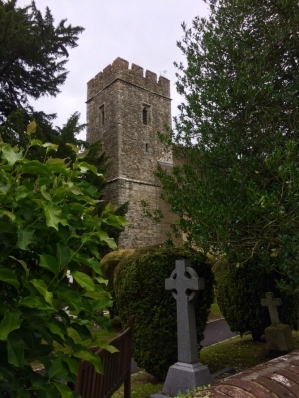 In 1523, a parishioner, William Coveney, left £5 to build a tower. There is a record of the vicar’s stipend for the year £3.6.4, so £5 would have been enough to build the base of the tower we see now. It would have had a wooden pyramid structure on top. In 1875 a major restoration of the church was begun. We might be a bit scathing about some of the “modernisation”, but we must be grateful for all work and money spent on the church, which kept it in good shape for the next 100 years or so. 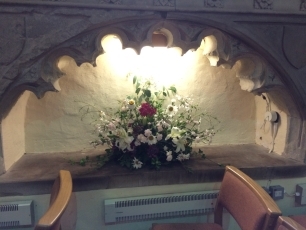 The box pews were removed, all apart from the Smiths Hall box pew which was left in situ for Sir Herbert Fitzherbert. Pine pews were installed and were to be for the use of all parishioners, except for two reserved for Court Lodge. 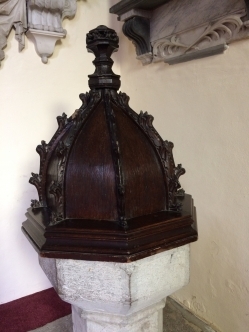 The three decker pulpit was removed and the current one installed. 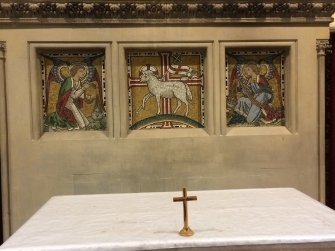 The Reredos with its mosaics, a new altar rail and choir stalls put in. An organ was installed in the chancel. The decorated pipes are still there. The Norman windows over the altar were fitted with stained glass. The ceiling plaster was removed to expose the oak beams. The floor was retiled. A Vicars Vestry was added and the South Porch was also renovated. As the drain pipes have the date on them, they must have been part of the restoration. The three bells date from the mid 1600’s, the tenor was recast in 1887,to commemorate Queen Victoria’s Golden Jubilee. Her diamond jubilee was marked by a wrought iron arch over the gate. 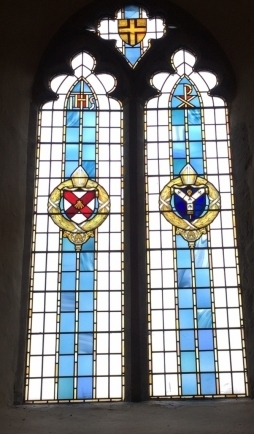 Two windows were fitted with stained glass, a painting of the arms of George III was restored and hung at the back of the church. It also has the arms of Canterbury and Rochester Dioceses. 1965 saw the ladies of the village busy making tapestry hassocks, at the instigation of Dorothy Day of Tutsham Hall. 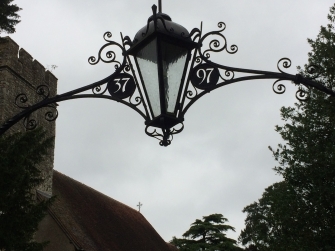 The Oak and wrought iron handrail was a gift from the Morlock family of Court Lodge in 1978, in memory of Victor Morlock an eminent physician and supporter of the church. The red velvet curtains separating the chancel from the Nave were made in 1979 at a cost of £300. 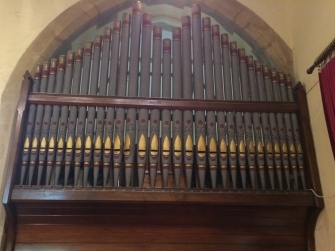 The Victorian organ was condemned as it had become contaminated with asbestos from the blower box, it was replaced in 1998 with an electronic organ. This organ is now in the Nave. It is much easier to play and has a magnificent sound. Tunes can be pre recorded and played back, so can be used even without an organist. When the church needed to be rewired it was decided that this was the time to make the church a more usable building, not just for worship but for community activities. The pews were taken out. The floor replaced and carpeted. Chairs bought and a lectern with microphone was given in memory of Lord Keyes of Elmscroft. New curtains were hung at the doors, a new heating and lightings system put in, a toilet put in and a servery made in the base of the tower. The church is now used for many secular activities. Do go and visit it. Do come along to our social and fundraising events. They are always well organised and good fun. It is there for the whole community. It can be hired for classes, parties, fundraising and anything which will not spoil the carpet!! Come along to a service, or if this is not for you, come along after a service, they last about 45mins and you can come in afterwards, be shown round or wander round on your own. It is your church, not just for those who worship on a Sunday! The Friends are villagers who are interested in and care about our historic church but are not necessarily churchgoers. They organise and host events, such as the Harvest Supper, concerts etc.everything except services!! They are a jolly bunch, if you would like to join them to help our church, they would be pleased to welcome you. email editor@farleighevents.com.